Suction? Suction caps work because air pressure on one side is no longer counterbalanced if there is a vacuum on the other. Because normal air pressure is 100 kPa (kilopascals), or 14 pounds per square inch, suction can be very effective. But geckos’ feet can stick in a vacuum where there is no air pressure, so suction cannot be the reason. Electrostatic attraction? This is the attraction between electrically charged objects, for example a plastic comb rubbed with cloth can pick up small pieces of paper. But when researchers zapped the surrounding air with X-rays to form charged molecules (ions), which would cause any charge to leak away, the feet still stuck. Ordinary glue? There are no skin glands to produce any. Friction? Keratin, the protein in skin, is too slippery. Interlocking between rough surfaces? Geckos can even stick to polished glass. The best explanation seems to be that the geckos’ feet can exploit the weak short-range bonds between molecules.1 That is, they stick via van der Waals forces.2 But for such weak forces to work, there must be an enormous intimate contact area between foot and surface, so that enough individual weak forces can add up to a very strong force. With special instruments,3 a team of biologists and engineers from several American universities analysed a seta from the foot of a Tokay gecko (Gekko gecko). The foot pad has an area of about 100 mm2 (0.16 sq. inch) and can produce 10 newtons of adhesive force (enough to support two pounds). But they showed that an individual seta had an attractive force 10 times stronger than expected. In fact, one seta is strong enough to support an ant’s weight, while a million could support a small child—about 10 N/cm2, where 10 newtons is about the weight of 1 kg. So the gecko has plenty of attractive force to spare. This means it can handle the rough, irregular surfaces of its natural habitat. Actually, the attractive force is far greater when the seta is gently pressed into the surface and then pulled along. The force also changes with the angle at which the hair is attached to the surface, so that the seta can detach at about 30°. These elaborate properties are exploited by the gecko’s ‘unusually complex behaviour’1 of uncurling its toes when attaching, and unpeeling while detaching. This all means that the gecko can not only stick properly with each step, but also avoid getting stuck, all without using much energy. Another amazing feature is that the gecko’s feet are self-cleaning—unlike sticky tape, to which dirt easily sticks, rendering it useless. Another amazing feature is that the gecko’s feet are self-cleaning—unlike sticky tape, to which dirt easily sticks, rendering it useless. The researchers are still trying to find out how geckos manage that. One evolutionist said: ‘It’s great to look at how evolution has solved mechanical problems’.4 But he never said how evolution, via chance mutations and natural selection, could have produced the complex foot structure as well as the movement pattern needed to use the structure properly. For example, there was no explanation of how half-formed setae and spatulae and an imperfect movement would benefit the animal and thus be selected for. This seems more like blind faith for people who have ruled out a Designer by decree. But is this legitimate? The researchers commented that designing such a structure is ‘beyond the limits of human technology’,1 especially finding a material that can be split so finely 1,000 times. If the structure is ‘beyond the limits of human technology’, then it’s reasonable to believe that it was designed by One whose intelligence is beyond our own. 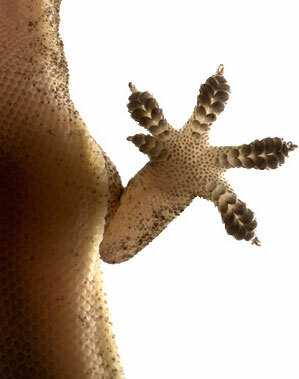 So not only can we not design anything as complex as the gecko’s foot, human designers are learning new things from it. This speaks of a Master Designer of the foot, who programmed the complex ‘recipe’ for the foot, as well as the movement patterns, into the gecko’s DNA. ‘For the unseen things of Him from the creation of the world are clearly seen, being realized by the things that are made, even His eternal power and Godhead, so that they are without excuse’ (Romans 1:20). Update 11 June 2003: A self-cleaning adhesive tape has now been manufactured modelled on the gecko’s foot. Andre Geim of the University of Manchester led a team from the Centre for Mesoscience and Nanotechnology at the University of Manchester, UK, and the Institute for Microelectronics Technology in Russia prepared fibres 2 microns long, with a diameter of around 500 nanometres and a periodicity of 1.6 microns, on a film of polyimide five microns thick.10 They used the advanced nanotechnology methods of electron-beam lithography and dry etching in oxygen plasma. Their tape, with a contact area of only 0.5 square centimetre with glass, could bear a load of more than 100 grams. However the tape is not durable enough to attach more than a few times unlike the real gecko. The researchers proposed that a more durable material might be what the real ones are made of—keratin. So once again, despite their ingenuity, the researchers cannot equal the original design, which evolutionists believe arose by time, chance and natural selection. Autumn, K. and seven others, Adhesive force of a single gecko foot hair, Nature 405(6787): 681–685, June 8, 2000; perspective by Gee, H., Gripping feat, same issue, p. 631. Return to text. Van der Waals forces are attractions between permanent or temporary dipoles in atoms or molecules, and are the reason that even gases like helium liquefy when cold enough. They are much weaker than bonds holding atoms together in a molecule, and the attraction energy decreases markedly with distance—inversely proportional to the 6th power. Return to text. A ‘micromachined, dual axis piezoresistive cantilever’. Ref. 1. Return to text. Bruce Jayne, a functional morphologist, cited in: Pennisi, E., Geckos climb by the hairs of their toes, Science 288(5472):1717–1718, June 9, 2000. Return to text. 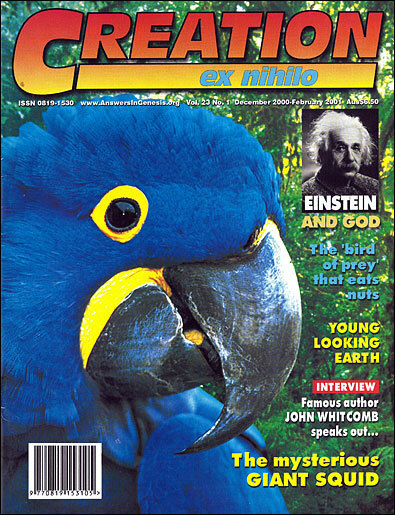 Saunders, F., Robo-gecko, Discover 21(9):93, September, 2000. Return to text. Autumn, K., cited in San Francisco Chronicle, June 19, 2000, p. A4. Return to text. Autumn, K., et al., Evidence for van der Waals adhesion in gecko setae, PNAS|10.1073/pnas.192252799, 27 August 2002. Return to text. A Teflon surface has very weak vdW forces because the fluorine atoms bonded to the carbon chain have very tightly bound electrons. This means they are very hard to polarize, or form the dipoles needed for vdW forces (Ref. 2). That’s why teflon is so slippery and chemically unreactive. Return to text. Graham-Rowe, D., Fancy a walk on the ceiling, New Scientist 178(2395):15, 17 May 2003. Return to text. Geim, A., et al., Microfabricated adhesive mimicking gecko foot-hair, Nature Materials 2:461–463, 1 June 2003; see PDF at nature.com. See also ‘Gecko tape’ sticks with polymer fibres, physicsweb.org. Return to text. Hu, C. and Greaney, P.A., Role of seta angle and flexibility in the gecko adhesion mechanism, J. Applied Physics, 12 August 2014. Return to text. Sirucek, S., How geckos turn their stickiness on and off, newswatch.nationalgeographic.com, 12 August 2014. Return to text.